Nurse Practitioners (NPs) are Advanced Practice Registered Nurses (APRNs) that have completed graduate-level training and possess prior nursing experience. NPs are growing in popularity each day. These clinicians blend the evidence from medical knowledge with the art of nursing to provide comprehensive care. Nurse Practitioners can diagnose and treat both acute and chronic health conditions, prescribe a variety of medications, and advocate for patient health promotion. The different specialties of NPs work with patients of all ages throughout the lifespan. NPs can opt to focus their practice in primary care, acute care, long-term care, and a number of specialties and sub-specialties. The unique aspects of clinical practice allow NPs to shine. Nurse Practitioners lean toward a more holistic path by focusing on highlighting the health and welfare of the whole person. They do not focus only on curing a disease or medicating a condition but also look at ways to promote health, prevent illness, and provide patients with a thorough education and counseling. Their distinctive skill set focuses on getting and keeping patients healthy. When patients choose to make healthy lifestyle changes, healthcare costs decrease. The contemporary model of the Nurse Practitioners was created in the 1960s, due to a primary care medical doctor shortage. The first graduate certificate program for NPs was created by the combination of Loretta Ford, a nurse, and Henry Silver, a physician. They created the program to eliminate the primary care doctor shortage, provide greater access to healthcare for patients, and cut rising health costs. In the 1980s, the completion of a master’s degree (MSN) became the entry-level requirement for NPs. Now there are reports that the Doctorate of Nursing Practice (DNP) will eventually become the minimum requirement for entry-level NPs by accrediting agencies, certifying bodies, and state boards alike. Nurse practitioners function in many roles than just health care providers. They are mentors, educators, researchers, leaders, policymakers, and administrators. NPs work to advance the role of the NP and uphold their professional standards very seriously. Their focus on health maintenance means that they are an integral part of the health system that provides healthcare for millions of patients in the United States. Thanks to NPs, more Americans are able to access quality care than ever before. Choosing a career as a Nurse Practitioner is a worthwhile pursuit, but there are many steps along the way. Many nurses first get their feet wet by jumping into the specialty they would like to pursue. For example, future Women's Health NPs start as nurses in labor and delivery, postpartum, or gynecologic services. Oncology nurses may pursue a career as an Oncology NP. Building up your nursing experience will only make you a better provider. The requirements for nursing experience prior to school vary tremendously among nursing schools and programs. The minimum requirements to become a Nurse Practitioner involve receiving a master's (MSN) or doctoral (DNP) degree from an accredited program. NP students receive advanced clinical training beyond the schooling that a Registered Nurse receives. This specialized education includes comprehensive coursework that spans both clinical experiences and classroom instruction. Student NPs spend time acclimating to the NP role in clinics, hospitals, and outpatient facilities. Student NPs will learn advanced nursing coursework that is diverse and covers a number of important advanced nursing provider criteria. Classes include physiology, pathophysiology, advanced health assessment, advanced pharmacology, health promotion and maintenance, disease management, and differential diagnosis. These classes and opportunities prepare NPs with specialized medical knowledge and clinical skills to practice as an advanced practitioner. In order to become a board certified Nurse Practitioner, the applicant must first have a nursing degree from a National League for Nursing (NLN) or Commission on Collegiate Nurse Education (CCNE) accredited college or university and a current, unrestricted Registered Nurse license. Next, you will graduate from an accredited education Master of Science in Nursing program. Once receiving your MSN degree is in the rearview, you will apply to sit for a demanding national certification board exam. In order to sit for an exam, you must have a current RN license, completed your post-graduate MSN or DNP degree in your specialty, 500 hours or more of supervised clinical hours, and specific graduate coursework (i.e. physiology, pathophysiology, and health assessment) from an accredited program. Once you've passed the national certification board exam, you will apply to your state board for licensure. This rigorous path ensures that only expert healthcare providers are recognized as NPs. Nurse Practitioners must also regularly participate in professional development and continuing education to maintain clinical proficiency. NPs also engage in regular peer review, clinical outcome evaluations, and programs to improve clinical outcomes (i.e. QI and QA: quality improvement and quality assurance). The American Academy of Nurse Practitioners National Certification Board (AANPCB) is an independent, nonprofit organization that is separate from the American Academy of Nurse Practitioners (AANP). The AANPCB provides a legitimate and consistent program for Nurse Practitioner. The AANPCB was established in the early 1990s and in 1999 became separately incorporated as the AANPCB and trademarked the credential Nurse Practitioner-Certified (NP-C). The certification program makes sure that NPs uphold the minimal professional standards of the AANPCB. The National Commission of Certifying Agencies (NCCA) depending on the specialty. The American Nurses Credentialing Center (ANCC) certification program allows NPs to demonstrate their expertise and validate their specialized knowledge. The AACN aims to maintain a high standard of excellence and professional growth in the critical-care nursing arena by ensuring the nurses it certifies possess advanced clinical experience and promote positive patient outcomes. The Pediatric Nursing Certification Board (PNCB) endorses optimal outcomes in worldwide pediatric health by establishing a pediatric certification program for pediatric NP specialties. The PNCB validates specialized pediatric nursing knowledge and standardizes the maintenance of clinical competence. The PNCB certification programs are accredited by the NCCA. A Nurse Practitioner can fulfill many roles in the healthcare sector. There are countless differing job descriptions based on your chosen career path. An NP works either independently or in collaboration with other health care professionals. The amount of autonomy that NPs have varies tremendously from state to state. Some states require that NPs form a collaborative agreement with a physician, others require that a physician directly supervises them, and the remaining states allow NPs to practice autonomously. Prescribing the appropriate medications, ordering durable medical equipment, and creating requisitions for additional treatments. Managing each patient’s comprehensive care as a medical home. Referring to specialists and/or physician care, as appropriate. Educating patients on health promotion, disease prevention, and healthy lifestyle changes. NPs can practice nearly everywhere. They have the ability to practice in every state in the United States and the District of Columbia. They are required to practice to the scope designated by the state board under which they are licensed. 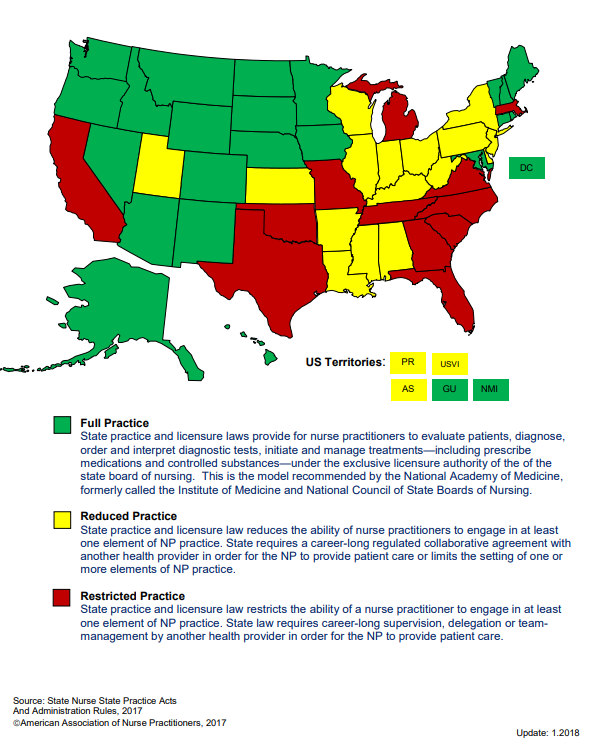 Each state has specific rules and regulations that describe the extent that an NP may practice. NPs practice in rural communities, suburbs, and busy metropolitan cities. They work in outpatient clinics, hospitals, emergency departments, urgent cares, private physician offices, long-term care facilities, skilled nursing facilities, schools, colleges, universities, and public health departments. Some NPs contract their services out to private organizations, medical staffing agencies, and hospitals as locum tenens. Becoming a Nurse Practitioner means taking on increased responsibility and constantly growing in knowledge and clinical skills. However, possessing great responsibility means being adequately compensated for the increased stress and liability on the job. The outlook is extremely bright for future NPs. The market for Nurse Practitioners will grow by 36%, surpassing average job growth for many other professions. The need for NPs will continue to rise as the population ages. 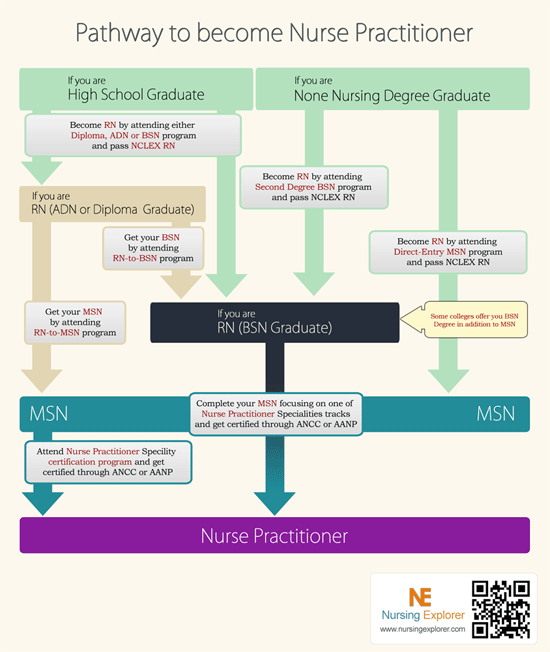 This means that becoming an NP is an extremely attractive option with significant job security. The average national salary for a Nurse Practitioner is $107,480 annually. The median hourly wage is $49.94 and the mean hourly wage is $51.68. The Bureau of Labor Statistics (2017) estimates that 166,280 Nurse Practitioners are employed. The statistics show that they are primarily employed in physician offices, general medical and surgical hospitals, and outpatient care centers. However, many NPs work in offices of other health practitioners and colleges, universities, and professional schools.